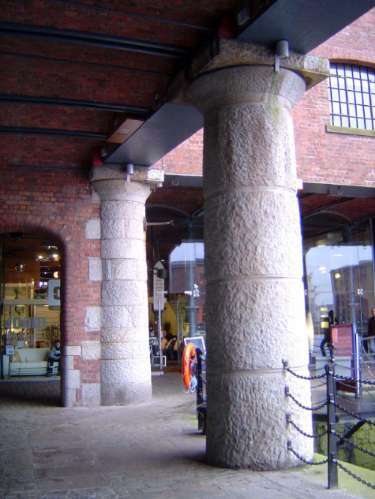 Cast iron was slightly cheaper than granite, but for some reason when the ends of the south warehouse were extended in 1853 the engineers chose granite. Nikolaus Pevsner might have been thinking of both iron and stone when he wrote that the Albert Dock, has a "sense of the cyclopean, the primeval, which is unparalleled" (quoted in Joseph Sharples, Liverpool 2004, p. 99). James Picton limited his praise and spoke of these buildings as a modern critic might condemn Brutalist architecture: "The works for strength and durability are unsurpassable, but it is to be regretted that no attention whatsoever has been paid to beauty as well as strength. The enormous pile of warehouses which looms so large upon the river, and its vastness surpasses the pyramid of Cheops, is simply a hideous pile of naked brickwork" (quoted in Hughes, p. 18).